I’ve been following the blog of Australian Author, Natasha Lester for a while now. She has some great content, and her books have been on my reading list for some time. 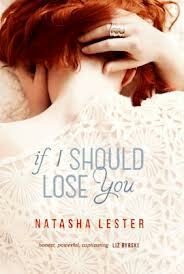 But it was this blog post that propelled her novel ‘if I should lose you’ to the top of my TBR list. In the post, Natasha gives 10 tips on how to write a brilliant beginning, and then she does a very brave thing – she allows us to see the original draft of the first chapter or so of ‘if I should lose you’, and compare it with the final published version, so we can see where the first draft was lacking, and how those issues were cleared up in the final copy. If you’re a writer, you might want to check it out, and even if you are not, it’s really interesting to see the changes that were made from first to final drafts. ‘if I should lose you’ tells the story of Camille, a transplant coordinator whose role is to support families through the difficult decision to donate their loved ones organs. At home she is on the other side of the fence, desperately awaiting a donor liver for her own sick child. The stress has impacted on her marriage, which seems to be slowly and surely crumbling away. When she’s asked to curate an exhibition of her late father’s sculptures she jumps at the chance to add a bit of interest and excitement to her life, but in the process learns more than she bargained for about her (both deceased) parents. This may sound like an odd thing to say, but I was really satisfied with the ending. I can’t really say why without giving any spoilers, except that it was not the ending I was expecting (because I had an expectation that most books end in a certain way, and so I thought this would be ‘most books’), and while this left a little uncertainty about certain matters, I felt it was the right way to end the story. Natasha Lester does a remarkable job of delving deep into the emotions of parenthood, marriage, and the horror and guilt of waiting, or worse still, hoping, for the death of another child so the life of your own might be saved. If you’re a fan of Jodi Picoult, I highly recommend you pick up this book.